As I mentioned right before it, Ladybug had a lip revision done last week. It went very well. Her surgeon was pleased with the results. She seems pleased with the results which is the most important thing. The actual surgery was quick taking only 1 1/2 hours. It was outpatient/ same day so we were able to go home in the afternoon. Would have actually left by noon, but Ladybug had some vomiting issues. That actually continued that first day until I got her off the strong narcotics they gave her for pain. She really have very little pain at all and none after the first 48 hours (except for the time Lil' Bug jumped on top of her and hit her lip!!!) The swelling was not awful, but did result in a quiet Ladybug for the first 2 days and a lisp for the next few. Here she is right after surgery and again a few hours later. 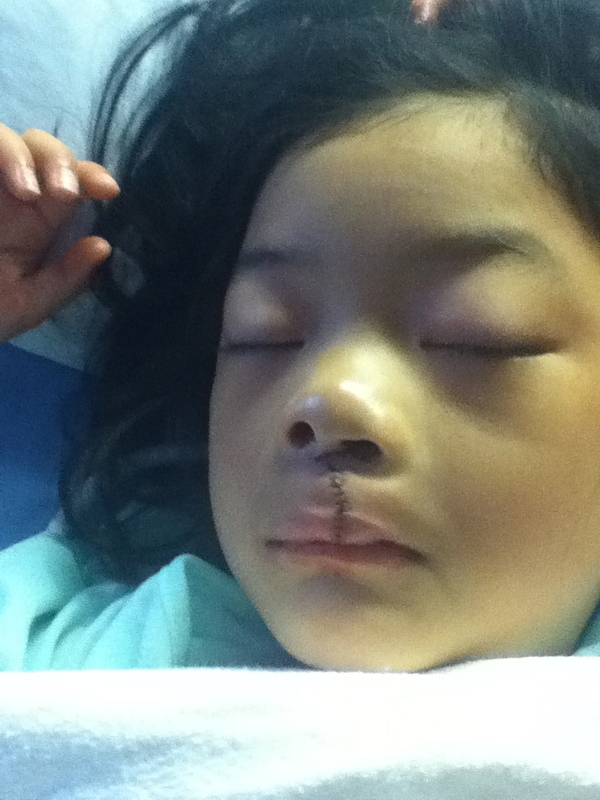 The sutures came out one week after the surgery and again required her to be put under this time for mere minutes . She recovered from that very quickly and was very glad to have the sutures out. So here we are less then two weeks out from the lip revision and Ladybug is basically back to her old self. It will take some time for the scar to fade and I'm not sure that there really is improvement at all in the actual lip. And while the difference isn't as much as we had hoped, her nose does seem to be less flat which was really our driving reason for doing this surgery. Tuesday evening (one week post-op) we did a little photo shot. Here is Miss Ladybug and her new smile. They say change is good. They say it will always come. I'm sure the second part of that is true, and I hope the first is too. In any case, tomorrow this beautiful face will change forever. I have to be honest and say I'm a little bit sad about that, but change will come and hopefully this is for the better!